Ellis was born in November 1817 in Esher, Surrey to parents Tabitha and William (aka William the waiter). She was the second of 6 girls (find out about the other 5). This makes her the first cousin of my great great great grandfather …… his brothers daughter. She was baptized on 28th December 1817 in Esher. In 1841, 23 year old Ellis was living with the family of a member of the Queens Household, Frances Norton, in York Street, St James, Westminster . He was Clerk Comptroller of the Royal Kitchens from 1840 to 1854 (per The Royal Archives). She was possibly their servant. The 1851 census shows her as being a 32 year old coffee room maid (actually 33) with her 25 year old sister Jane at Buckingham Palace. Both are with the Lord Stewards Department. Albert and Victoria (born 24 May 1819) were resident with their young family. Victoria was just 18 months younger than Ellis and her occupation was described as “The Queen”. Ten years later in 1861, Ellis is now on the Isle of Wight at Osborne House. She is shown as being 40 years old (actual 43) and again, a coffee room maid “belonging to the Lord Stewards Department”. 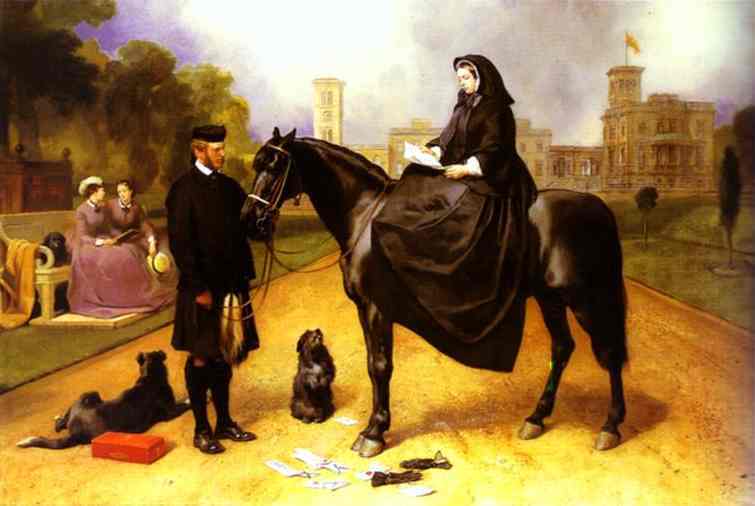 This is a copy of a painting of Queen Victoria at Osborne House in 1865. "I have made a search of our records and have found a brief reference to Ellis Wareham and can confirm that she entered the Royal Household as First Assistant in the Coffee Room in 1842 and retired in 1867. Her sister, Jane Wareham, entered the Royal Household in 1844 as a Coffee Room Assistant. She resigned from the position of Second Assistant in the Coffee Room on 25th October 1859. You mention in your letter that Ellis Wareham was living with Francis Norton in 1841. I can confirm that Francis Norton was Clerk Comptroller of the Royal Kitchens from 1840 to 1854." (I also sent an email to English Heritage saying that my great great great grandfathers brothers daughter was Queen Victoria's coffee maid at both Buckingham Palace and Osborne House with the Lord Stewards Department. I asked them if there were any photographs or staff records between the mid 1840's and the mid 1860's. They have referred me to the National Monuments Record Centre in Swindon where their archives are kept. A day trip is needed). Ellis died on 21st January 1868 aged just 50 years old at 58 Stanley Street, Pimlico, Belgrave. Her death certificate says she died of a “fibroid tumour of the uterus”. She left a Will with effects under £800 and is described as a spinster. The Will (a copy of which I have now received but have yet to scan) was proved by John Martin, the husband of the younger sister who worked with her at Buckingham Palace. He was also the informant “present at the death”. Jane Wareham : I haven’t found Jane on the 1861 census but she had married John Martin in 1859. John also worked for Her Majesty’s Household (1871 and 1881 census). By 1901 he is described as a retired civil servant aged 81 still living with his 75 year old wife, Jane. I suspect both die before the 1911 census. A very good website I found has a study of Queen Victoria's staff at Osborne House.